A simpler way for Chinese organizations to safeguard their Windows and Active Directory Infrastructure. Currently with over 3200 customers from 129 countries around the world, IS Decisions, a global software company specializing in Security & Access Management solutions for Microsoft Windows and Active Directory, has announced that it is boosting its international development strategy with a launch into China. Based in Biarritz, France, IS Decisions has built a strong global presence with over 90% of turnover now generated from international markets. Security and emergency response are “global” issues, so organizations everywhere in the world need to prevent security breaches, ensure compliance with major regulations and respond to IT emergencies quickly and remotely. Customers include some of the most security-sensitive organizations around the world, including Barclays, Boeing, FBI, Honda, Interior Ministries of the Kingdom of Saudi Arabia and Qatar, National Bank of Kuwait, Lockheed Martin, United Nations Organization and US Navy Marine Corps. The launch into China completes an intense preparatory period that has lasted nearly one year. This has included thorough market research, the translation of the software UserLock (network access protection) and FileAudit (data access protection) as well as the preparation of all technical and marketing documentation for future Chinese clients. IS Decisions has also been preparing for its official launch by attracting new partners in Shanghai, Beijing and Chongqing. Among its new partners, IS Decisions has signed with GBICC, Evget, Qast Software and Bizsafe, all major distributors of software across China. The company has also announced the opening of an office in Shanghai to provide local support and proximity to its new partners and to be able to offer the exceptional level of service that customers expect in China. 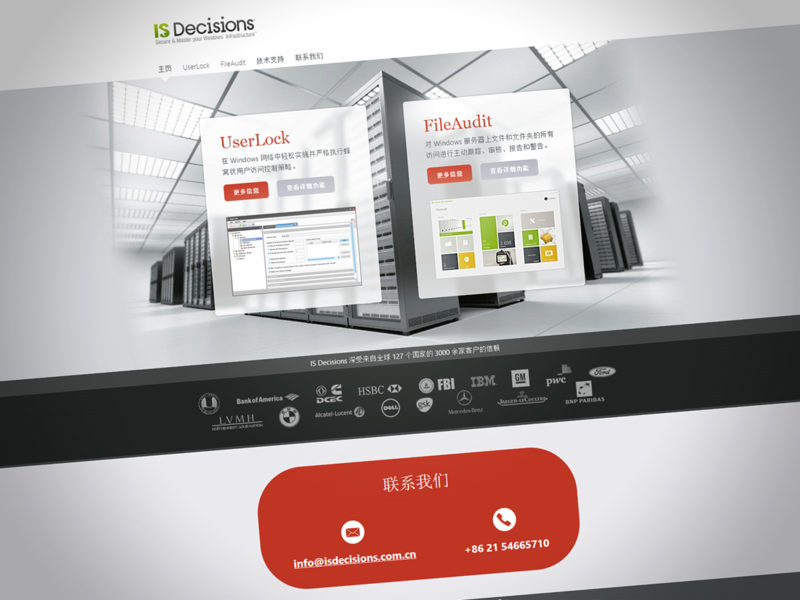 To support their new Chinese partners, IS Decisions have also created a Mandarin website, www.isdecisions.com.cn that’s hosted locally. Contemporary and streamlined, the website showcases the company’s best-in class, reliable security solutions around network and file access. Simple to use and simple to install, the solutions, UserLock and FileAudit, offer powerful security that today’s business world mandates with the innovative simplicity the modern user expects.